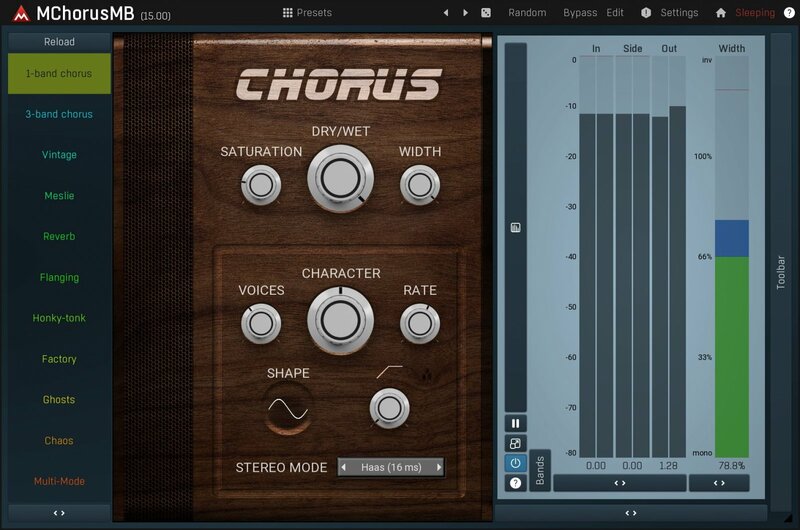 Chorus is an essential tool for guitars and keyboards to bring out space and width. MMultiBandChorus is not only potentially the best sounding chorus effect on the market, but also the most versatile one. If you aim for an ultimate chorus with both audio quality and features, then this plugin is what you have been searching for. One of the differences between a high-end chorus and a cheap toy is in the decorrelation of each voice. If the voices are too similar, phasing occurs, the chorus sounds predictable and just ugly. MMultiBandChorus will stand up, even for the most demanding ears, and can adjust to any audio material. With upsampling and sinc-interpolation it cannot be beaten in the terms of audio quality. 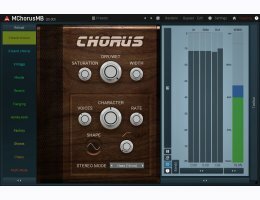 MMultiBandChorus provides way more than common chorus effects. Features such as custom oscillator shapes, analog-like saturation, voice tremolo and multiple spread modes you can hardly find somewhere else. And with 6 bands you can really start being creative.